This study confirms that the holistic capacity of honey, which is rich in sugars, cannot be duplicated to possess the same anticancer effects as lab-created honey. Honey has unique origins from the nectar sources to the transitional processes that honey bees use to make it medicinal and nutritional. Honey is good medicine. High concentration of sugar is carcinogenic. Honey which is rich in sugars has been shown to have anti-cancer effect. There is no study reported on the effect of sugars mimicking the concentration of sugars of honey (honey-mimic) in inhibiting breast carcinoma in rats. The aim of the study is to investigate if honey-mimic has similar effect as natural honey on experimental breasts tumor induced by N-methyl-N-nitrosourea (MNU) in rats. The mean number of tumors developed per rat in groups 2, 3, 4 was 4.9 +/- 0.60, 3.6 +/- 0.40 and 3.4 +/- 0.30, respectively. The mean tumor weight and volume in the negative and positive control group were significantly larger at 11.85 +/- 1.01 g and 8.50 +/- 0.40 cm3, respectively; while in the test groups (Groups 3 and 4) were 6.45 +/- 0.60 g and 4.50 +/- 0.20 cm3; 4.34 +/- 0.35 g and 2.50 +/- 0.20 cm3 (p < 0.05), respectively. Histopathological grading revealed that the majority of rats which received honey-sugar mimic and honey were of grade 1 and 2 compared to control, which were of grade 3. Sugar concentration mimicking composition of sugars in natural honey has some anti-carcinogenesis modulation properties but not as effective as honey. This is an amazing discovery for diabetics, as the use of propolis aids the body by regulating the immune system to protect it. As it's been described, honey bees make propolis from a naturopathic formula, which protects the liver, pancreas and kidneys. 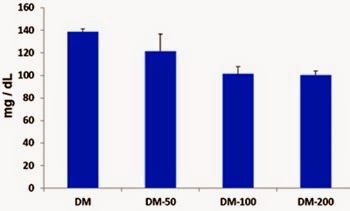 In the present study, we examined the effect of ethanolic soluble derivative of propolis (EEP) extract on immunological function in diabetic mouse models with the aim of highlighting the role of regulatory T cell, the change of cell surface molecule, and in vivo productions of IFN-gamma. Murine models of diabetes mellitus (DM) were created by injecting normal mice with S961 peptide. Normal BALB/c mice were injected intraperitoneally with peptide S961 300 mg/kg body weight (BW) twice a day for eight days. On day 15, the spleen was isolated; then, cell surface molecules and regulatory T cells were analyzed using flow cytometry. The histopathological changes were monitored in the liver of treated and control mice. Afterward, we tested the ability of propolis as an immunomodulator that initiate normality metabolism and homeostasis. The propolis decreased blood sugar levels and increased the number of naive T cells expressing CD62L molecule by suppressing the development of effector cells in diabetic mice. However, the propolis stimulated development of effector cells, which was indicated by increasing the number of CD4+CD25+ T cells in normal mice. Moreover, the propolis increased the production of IFN-gamma in normal mice, whereas in mouse models of diabetes mellitus propolis tends to suppress the production of IFN-gamma. 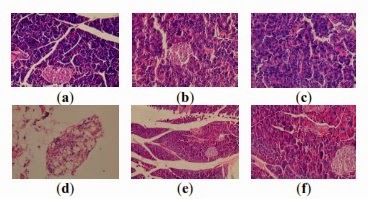 The histological analysis of the liver shows that at a dose of 50-200 mg/kg BW propolis does not show a toxic effect so that the dose is categorized safe. Therefore, the ethanolic soluble derivative of propolis (EEP) extract warrant for further exploited as an antidiabetic agent that safe for human. Click here to download complete study. Royal jelly is a hormone-rich substance that is encouraged for women, whether during pregnancy or in menopause. This triple-blind study reinforces the benefits women gain when consuming royal jelly to diminish PMS. Studies dating back to the 70's, identified that a blend of bee pollen and royal jelly reduced symptoms of PMS and menopause. In fact, royal jelly plays an important role in regulating hormones, not only for women, but for men as well. Premenstrual syndrome (PMS) may have negative effects on women's health and sometimes need therapeutic non-pharmacological management. To determine the effect of oral consumption of 1000mg Royal Jelly capsule on premenstrual syndrome. This is a randomized, triple-blind, placebo-controlled clinical trial, which was conducted in Tehran University of Medical Sciences female dormitories between December 2011 and October 2012. The study population comprised 110 medical sciences student with PMS, whom were randomly assigned to an intervention or a control group. Each participant in the intervention group took one Royal jelly capsule orally per day, starting on the first day of menstruation and continued the same treatment daily throughout two consecutive menstrual cycles, while participants in the intervention group took placebo capsules as same method. The outcome measure in this study was PMS score as obtained through the Premenstrual Profile 2005. The mean of personal characteristics and baseline level of the premenstrual score before intervention did not differ between groups. 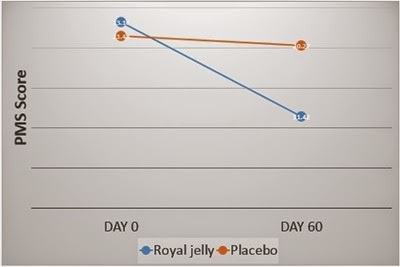 After two consecutive months consumption of Royal Jelly, PMS score had decreased from 23.17±17.43 to 11.42±14.58 (mean change: 11.75; 95% confidence interval [CI]: 8.31-15.19) and in Placebo, PMS score changed from 21.48±16.39 to 20.27±15.76 (mean change: 1.20; 95% CI: -1.69 to 4.10). Also difference between mean changes was significant (mean difference: 10.54; 95% CI: 6.10-14.98). A fantastic study revealing the "synergistic effects" of an Apitherapy diet, combining multiple bee products enhances the effects of each individual product thereby boosting the overall results. This study reaffirms the previous results which identified the detoxing effects of honey and propolis on liver and kidneys. The human body is exposed nowadays to increasing attacks by toxic compounds in polluted air, industrially processed foods, alcohol and drug consumption that increase liver toxicity, leading to more and more severe cases of hepatic disorders. 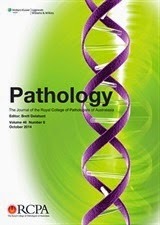 The present paper aims to evaluate the influence of the apitherapy diet in Wistar rats with carbon tetrachloride-induced hepatotoxicity, by analyzing the biochemical determinations (enzymatic, lipid and protein profiles, coagulation parameters, minerals, blood count parameters, bilirubin levels) and histopathological changes at the level of liver, spleen and pancreas. The experiment was carried out on six groups of male Wistar rats. 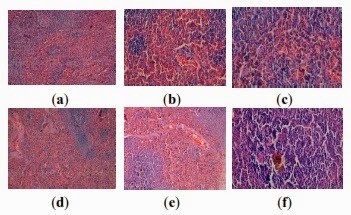 Hepatic lesions were induced by intraperitoneal injection of carbon tetrachloride (dissolved in paraffin oil, 10% solution). Two mL per 100 g were administered, every 2 days, for 2 weeks. Hepatoprotection was achieved with two apitherapy diet formulations containing honey, pollen, propolis, Apilarnil, with/without royal jelly. Biochemical results reveal that the two apitherapy diet formulations have a positive effect on improving the enzymatic, lipid, and protein profiles, coagulation, mineral and blood count parameters and bilirubin levels. The histopathological results demonstrate the benefits of the two apitherapy diet formulations on reducing toxicity at the level of liver, spleen and pancreas in laboratory animals.